Previously, I showed how you can run Munki in a Docker container. Then, I talked about how to build Munki to use Puppet for SSL certificates. Assuming you’ve got a running Puppetmaster image (which I talked about building previously), let’s run the Munki-Puppet image we just built. Since we’re adding SSL support to the Nginx webserver, we want to make sure that the container is accessible at port 443, the default SSL port. The --link argument allows us to tell the Munki container that it can access any exposed ports from the Puppetmaster container by the DNS entry for “puppet”. Since the Puppet agent always tries to access “puppet” to check in, this means that the Munki container will have no trouble with Puppet. Verify that it receives a signed certificate from the Puppetmaster. Now we’ve got a running Nginx container with our Munki repo, except it’s still only serving content at port 80. We need to tell Nginx to use our SSL configuration. We have an empty Munki repo, so we should populate it first. Once the repo has some content, we need to add in the Nginx SSL configuration. ssl_ciphers	"EECDH+ECDSA+AESGCM EECDH+aRSA+AESGCM EECDH+ECDSA+SHA384 EECDH+ECDSA+SHA256 EECDH+aRSA+SHA384 EECDH+aRSA+SHA256 EECDH+aRSA+RC4 EECDH EDH+aRSA RC4 !aNULL !eNULL !LOW !3DES !MD5 !EXP !PSK !SRP !DSS"
Otherwise, the configuration for Nginx for the Munki repo remains the same as the non-SSL version – we’re serving the file path /munki_repo as https://munki/repo/. Stopping the container will send a graceful “shutdown” signal to Nginx, and starting the container will bring it up as it expects. All of the following steps should be done on your OS X Munki client. If you haven’t already, run puppet agent --test as root to get a signed certificate. sudo defaults write /Library/Preferences/ManagedInstalls SoftwareRepoURL "https://munki/repo"
Now you’ve got secure Munki communication from clients to server, using Puppet’s client certificates, all in Docker! The base of this article was taken from my README. In the previous post, I built a container that serves static files at http://munki/repo using Nginx. Now that we have build the Docker image, let’s put it to use. We’re going to hook up the Munki image to a data-only container. Data-only containers are a way of keeping data portable and not tying it to specific locations or configurations on the host OS. This data-only container serves one purpose: to store the contents of the Munki repo and share it with other containers. The benefit to doing this is that we can raise and destroy as many Munki server containers as we want without losing any data (such as the contents of the Munki repo). That’s the base command for running a docker image. This runs the container in “detached” or “daemon” mode, where it runs in the background until we stop it (or it halts execution for some reason). Normally, when you run a Docker container, it picks a random human-readable name. Otherwise, you can refer to a container by its numerical ID number. By using --name, we can provide a meaningful name that we can refer to later. This container’s name is “munki-data”. The entrypoint for a Docker container is a command that executes upon running of the container. This is the technique Docker containers use to run in the background – by auto-executing a command. More information about entrypoints can be found here and here. This particular entrypoint is /bin/echo – meaning it will simply echo something out and then halt the Docker image. The name of the image I’m running. For more info on data containers read Tom Offermann‘s blog post and the official documentation. Note that after you run this image, the Docker container is stopped – check docker ps vs. docker ps -a. That’s okay – the data-only container doesn’t need to be running to contain data. It doesn’t use any system resources (except for file system space), and can be accessed for data by other containers while not running. We now have a data-container to store our data in, let’s run the Munki container and start the Nginx webserver. This maps port 80 from the container to port 80 on the host. In other words, it means we can access this container by going to http://localhost:80/ on the Docker host. The -h argument tells the Munki container that its hostname is “munki”. If your Dockerhost has a search domain configured in its DNS settings, it’ll append the search domain onto the hostname. This argument is technically optional as none of the services we’re using in this example make use of it. The name of the image we’re running. Check with docker ps to make sure the image is running. If you access http://localhost:80/, you should see the default Nginx welcome page. Now we have an empty Munki repo running from Nginx. We should populate this repo with content. Docker makes this nice and easy, because we can instantly spin up a new container with the functionality we want and just link our existing containers. 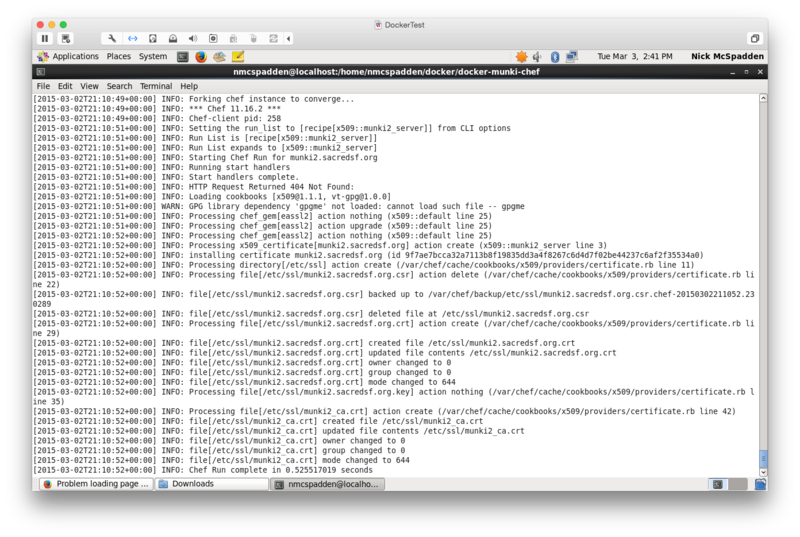 Since both Munki and munki-data have an exposed volume – /munki_repo/ – we can use a Samba/SMB container to share out this directory to an OS X client, where we can use the Munki tools to follow the Demonstration Setup. Check permissions now with docker exec smb ls -alF /munki_repo to make sure. From an OS X client, Go -> Connect to Server -> smb://docker_host_IP/ and authenticate as Guest to the Public share, which will mount as /Volumes/public/. Populate the Munki repo using the usual tools – munkiimport, manifestutil, makecatalogs, etc. Try making a site_default manifest. In the next post, I’ll talk about using Puppet to secure the repo with SSL.